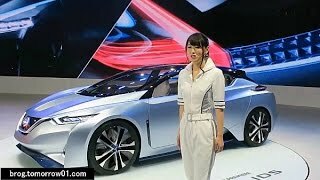 At the 2015 Tokyo Motor Show, Nissan introduced its futuristic Nissan IDS Concept 2015. Loaded with some mind blowing features, the concept has everything making your experience safe, clean, efficient and full of fun. 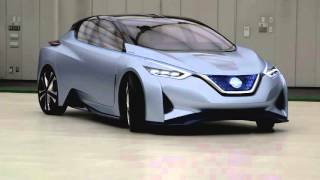 Let us have a look at the review of Nissan IDS Concept 2015 to know in detail about it. The interior of Nissan IDS Concept 2015 is too futuristic and this will indeed gain those numerous ‘wow’ accolades for it. The first thing you’ll notice inside the concept is wood grain paneling and leather work. There is a switch on the driver seat that will take you to manual mode from auto and vice versa. You’ll find pedals for acceleration and brake are mounted nearby and thus the ‘Switches queue’ ends with these three. The dashboard looks totally blank when the concept in on manual mode. The steering wheel; I guess this should be the name is unique in its own way. The integration has handles on each side for controlling and few touch controls. There is also a heads up display to feature the vehicle speed and battery charge while in manual mode, the ambient lighting enters and glorifies pedals and dash with blue lighting. A large screen join while the steering retracts entering in autonomous mode, seats turn inward and ambient goes off. Thus rounding up the entire interior details of Nissan IDS Concept 2015 all I can say is, the future of automotive industry looks stunning. The exterior of Nissan IDS Concept 2015 has been designed to accomplish the aerodynamic performance target on primary basis. Starting with the front fascia, it has ice-block shaped grille featuring a transparent look with blue glow behind it. The headlights sitting start from corners of the grille and extend till almost the halfway of hood. Beneath you’ll notice air vents on each side while moving towards the rear end there’s another ice-block shaped panel at the rear running between the boomerang-shaped sharp taillights. The roof is amalgamation of glass and carbon fiber giving the passengers a view of the outside. 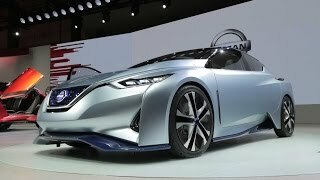 Thus rounding up the exterior details of Nissan IDS Concept 2015 I would say, it is an aerodynamically designed performance focused concept with superiorly futuristic looks. Though company didn’t share the performance figures and power output of Nissan IDS Concept 2015, we do know that with this concept the company’s target is to reach zero fatalities and zero emission. So somewhere the presumptions mark towards possibility of having an electric engine with sufficient power for a decent ride. Looking at the interior details we are sure it isn’t made to perform furiously and thus a decent power output is all we expect the model to come with rolling over its 20 or 21- inch wheels.